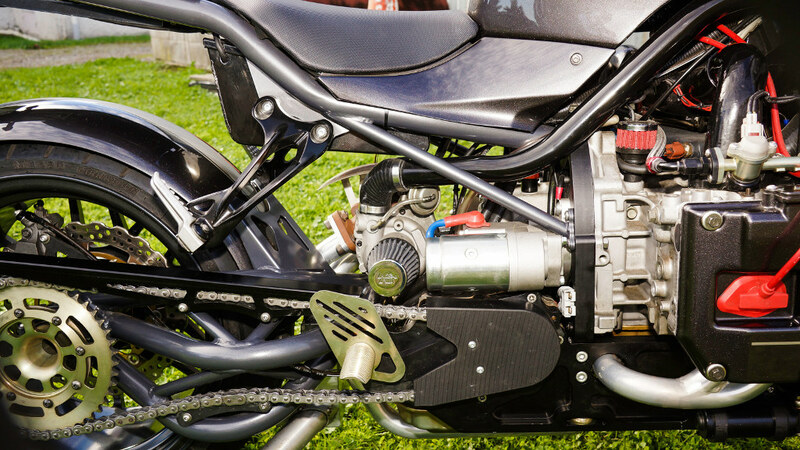 It’s not uncommon for a motorcycle engine to make its way into an automobile as we’ve seen with the Hayabusa powered Mini’s out there. 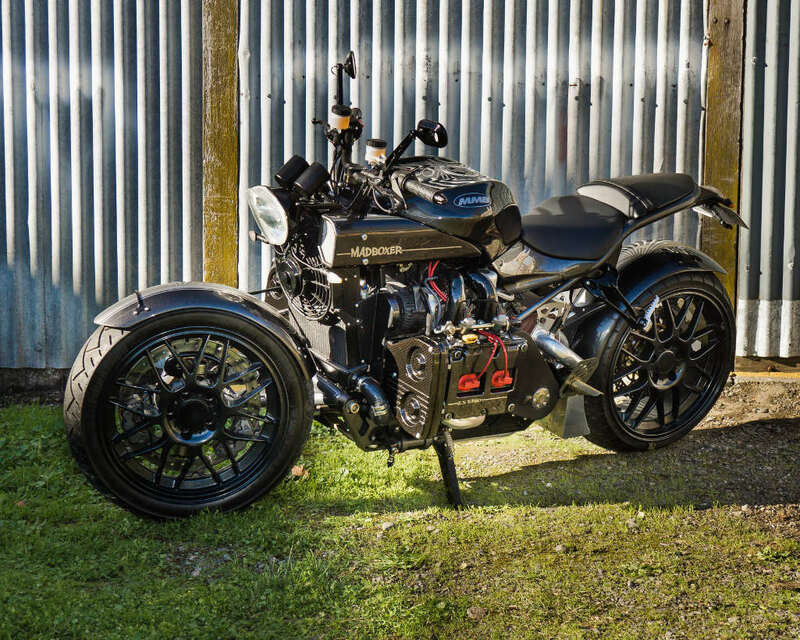 And it’s not even terribly uncommon for a motorcycle to have a car engine wedged into it as we’ve seen with companies like Boss Hoss who puts massive V8’s into Harley Davidson style bikes. 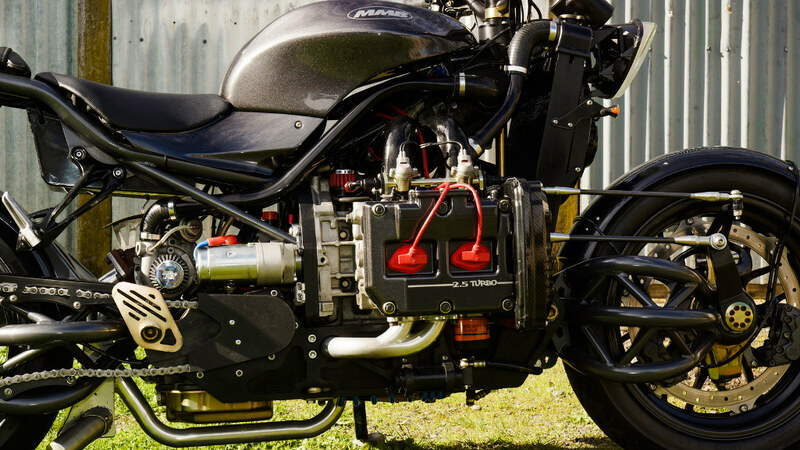 However, this is a car/motorcycle engine swap, unlike anything we’ve ever seen before. 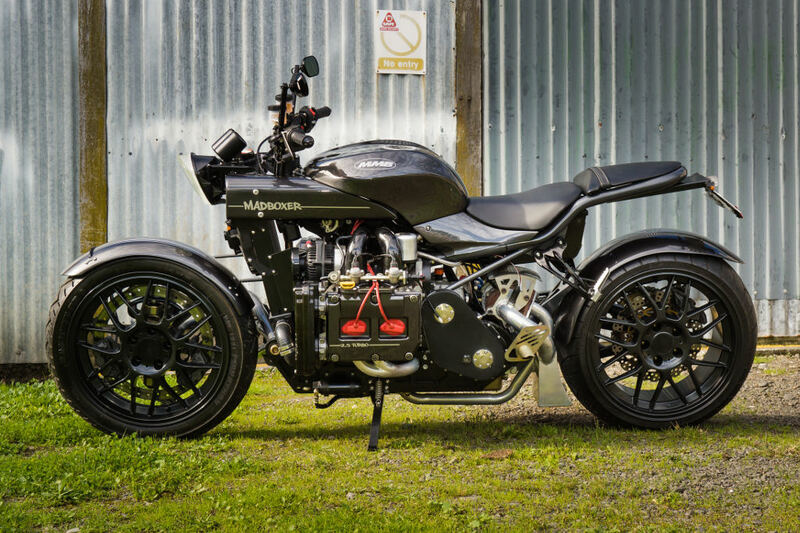 Meet the Madboxer, a custom built, one of a kind machine put together by a talented New Zealander, Marcel van Hooijdonk. What makes the Madboxer so special is the fact that powering this beast of a machine is actually an EJ25 2.5L turbo flat-four boxer engine from the second generation Subaru WRX. The fact that this is such a random choice of powerplants is what makes it so appealing as far as I’m concerned. Most people can’t even fathom the amount of time and effort it takes to build something like this. There are no plans or blueprints, no parts, bracketry, nothing. And that means the only way Hooijdonk was going to make it work was to create and build the parts himself. Apparently, it all started with a challenge from a friend and the end result is this incredible piece of machinery you see before you. As you can imagine, the biggest issue was getting the rather large, unconventionally shaped engine to fit. After doing some major brainstorming, Marcel realized it would never fit in a standard bike frame. 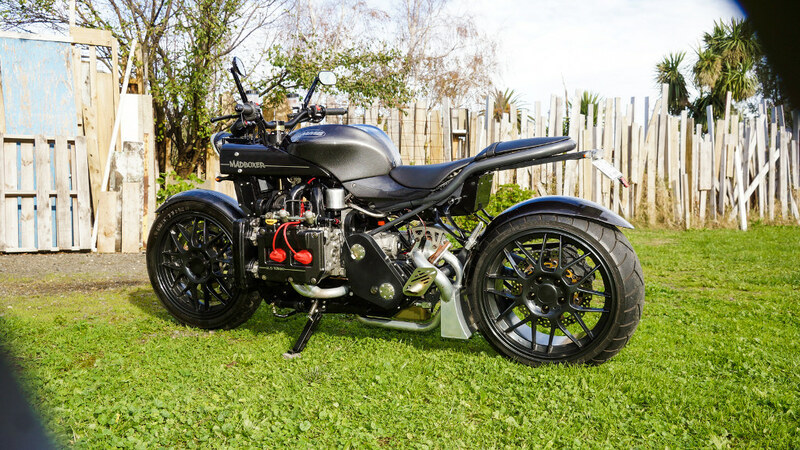 So he came up with the brilliant idea to build the frame, and the rest of the bike, around the boxer engine. That way it was surely going to be a perfect match because it was designed that way from the beginning. Granted, that may seem like a lot more work but it was clearly the right thing to do. 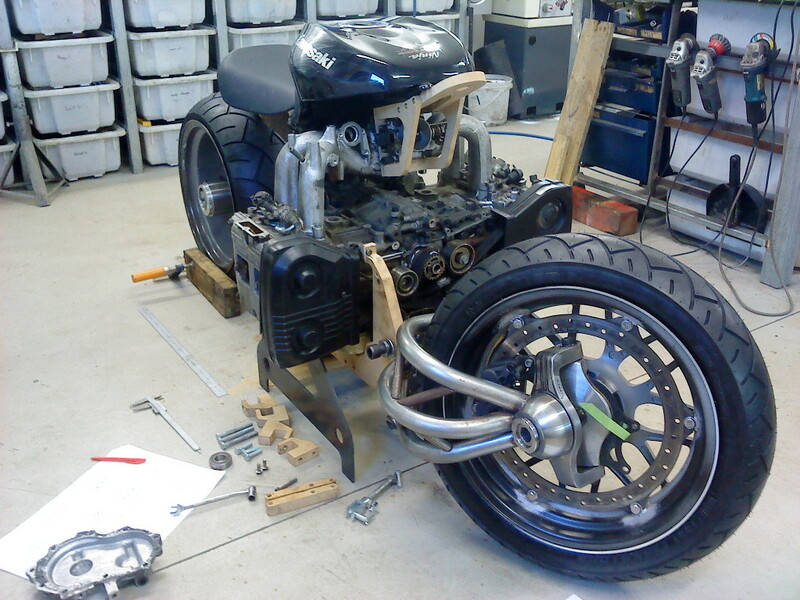 Even still, some minor modifications had to be done to the engine in order for it to work. For example, the massive single turbo that came standard had to be replaced with a smaller twin turbo setup. Marcel then attached a Japanese made 2-speed automatic transmission to provide a smooth power delivery to the rear wheel. Since it’s an automatic there isn’t the gear lever on the footpegs, instead, there’s a button on the handlebars that acts more like a gear selector. 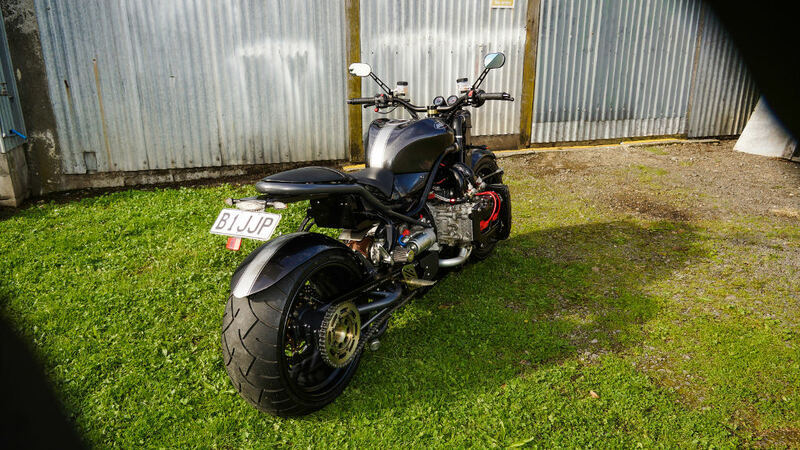 But don’t you go calling it a scooter, this thing is still a motorcycle and has all the badassery to prove it. After all, since when are scooters this cool, or look this good. The best part about this crazy design, it’s completely road legal and Marcel plans on making sure it has plenty of time out on the road too. Most people that devoted five years of their life to a one of a kind build like this would consider it a trailer queen and would only bust it out at shows. But Marcel thinks that would be a crime against humanity, and I tend to agree with him.